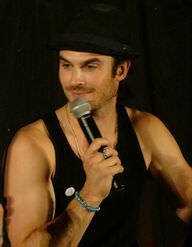 Interview with Ian Somerhalder from The Vampire Diaries in June 2012. Ian Somerhalder is an actor, model and director who rose to prominence portraying the character Boone Carlyle in the hit TV drama Lost. He is also known for playing Adam Knight in the TV series Smallville and Damon Salvatore in The Vampire Diaries. His professional acting career began in 1997 with a minor role in The Big Easy episode The Black Bag. He went on to play several film and television roles before finally making his breakthrough in 2004 when he landed a role in the TV series Lost. He is the son of Edna and Rober Somerhalder. He has an older brother named Robert and a younger sister named Robyn. He married actress Nikki Reed in April 2015. Actors Ian Somerhalder and Nina Dobrev at the 2012 ComicCon International. Ian Somerhalder is a famous American actor, who was born on December 8, 1978. As a person born on this date, Ian Somerhalder is listed in our database as the 2nd most popular celebrity for the day (December 8) and the 6th most popular for the year (1978). People born on December 8 fall under the Zodiac sign of Sagittarius, the Archer. Ian Somerhalder is the 31st most popular Sagittarius. Aside from information specific to Ian Somerhalder's birthday, Ian Somerhalder is the 200th most famous American. In general, Ian Somerhalder ranks as the 334th most popular famous person, and the 67th most popular actor of all time. “The Famous Birthdays” catalogs over 25,000 famous people, everyone from actors to singers to scientists to serial killers and more. If you're curious to see who was born on your birthday, you can use our database to find out who, what, where, when and why. You can search by birthday, birthplace, claim to fame or any other information by typing in the search box, or simply browse our site by selecting the month, the day, the horoscope, or any other clickable option.